Josef Alois Krips (8 April 1902 – 13 October 1974) was an Austrian conductor and violinist. Krips was born in Vienna. His father was Josef Jakob Krips, a medical doctor and amateur singer, and his mother was Aloisia, née Seitz. Krips was one of five sons. Krips went on to become a pupil of Felix Weingartner and Eusebius Mandyczewski. From 1921 to 1924, he served as Weingartner's assistant at the Vienna Volksoper, and also as répétiteur and chorus master. He then conducted several orchestras, including in Karlsruhe from 1926 to 1933. In 1933 he returned to Vienna as a resident conductor of the Volksoper and a regular conductor at the Wiener Staatsoper. He was appointed professor at the Vienna Academy of Fine Arts in 1935, and conducted regularly at the Salzburg Festival between 1935 and 1938. In 1938, the Nazi annexation of Austria (or Anschluss) forced Krips to leave the country. (He was raised a Roman Catholic, but would have been excluded from musical activity because his father was born Jewish.) Krips moved to Belgrade, where he worked for a year with the Belgrade Opera and Philharmonic, until Yugoslavia also became involved in World War II. For the rest of the war, he worked as an "industrial clerk" in a food factory. On his return to Austria at the end of the war in 1945 Krips was one of the few conductors allowed to perform, since he had not worked under the Nazi régime. He was the first to conduct the Vienna Philharmonic and the Salzburg Festival in the postwar period. Working with fellow conductors Clemens Krauss and Karl Böhm, Krips helped restore the Vienna State Opera and Vienna Philharmonic to their prewar levels. From 1950 to 1954, Krips was principal conductor of the London Symphony Orchestra. 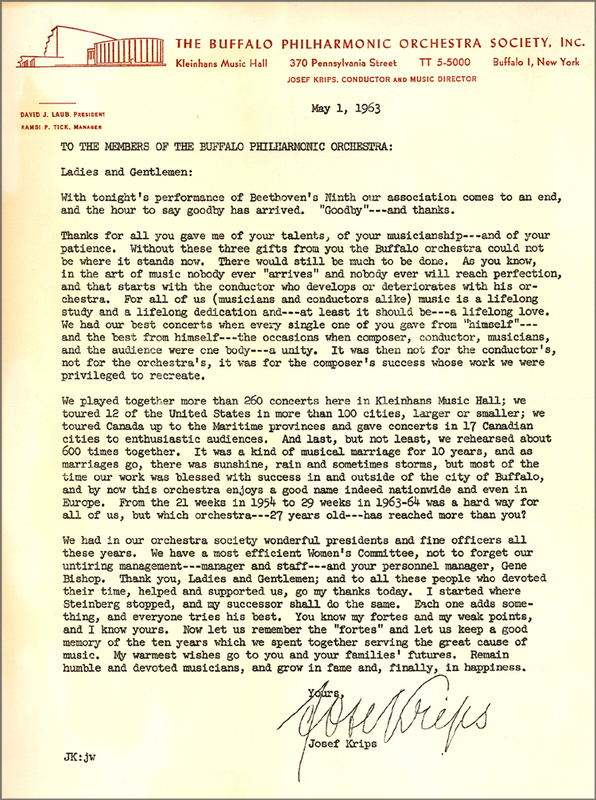 Afterwards, he led the Buffalo Philharmonic Orchestra from 1954-1963. Under Krips' leadership, the orchestra expanded in the length of its performance season and in the number of musicians that the orchestra employed. Krips took the orchestra on tours in eastern United States and Canada, including the Maritime Provinces. For his time with the Buffalo Philharmonic, Krips largely eschewed recent compositions and "concentrated largely in European classical and romantic literature." Later, during his final seasons, Krips began to program "a few contemporary works." During this period, Krips guest conducted other orchestras. For example, in February 1960 Krips guest conducted the Montreal Symphony Orchestra with a performance of works by Mozart and Brahms. Krips appeared as guest conductor with the New York Philharmonic in the Fall of 1964, and the program included works by Brahms, Copland, and Schumann. Leaving the Buffalo Philharmonic in 1963, Krips served as the Music Director of the San Francisco Symphony from 1963 to 1970. During his tenure with the San Francisco Symphony, Krips conducted 210 works with the orchestra. Of these works, 91 works were by twentieth century composers. In San Francisco, Krips conducted several world premieres. Krips premiered the First Symphony of Kirke Mechem in 1965. He premiered William Walton's Improvisations on an Impromptu of Benjamin Britten in 1970. Krips made his Covent Garden debut in 1947 and his Metropolitan Opera in 1966, guest conducting frequently from then on. Krips made his first appearance with the Boston Symphony Orchestra at the 1968 Berkshire Festival. In 1970, he became conductor of the Deutsche Oper in Berlin. Between 1970 and 1973, he was the principal conductor of the Vienna Symphony. Krips died at 72 in Geneva, Switzerland in 1974. The cause of death was lung cancer. Krips was twice married. His first wife was Maria "Mitzi" Wilheim, a singer whom Krips had coached and married in 1947. The two remained together until Wilheim's death on April 8, 1969. Krips married his second wife on October 9, 1969. According to Ewen and the New York Times, Krips' second wife was "the former Baroness Marietta von Prohaska." The New York Times noted that von Prohaska was his "29‐year‐old secretary." Other sources list the name of Krips' second wife as "Harrietta Krips." In the Reuters obituary notice for Josef Krips, her name is listed as being "the Baroness Henriette Prochazka." The Boston Symphony Orchestra Archives has a photograph of Krips and his second wife attending a Tanglewood concert, where she is identified as "Baroness Harriet Prochazka." Krips' second wife died on 12 January 2015. Krips' brother, Henry Krips, emigrated to Australia and was the chief conductor of the South Australian Symphony Orchestra (later known as the Adelaide Symphony Orchestra) for 23 years (1949-1972). Both brothers appeared together as conductors at a 1963 concert of the Queensland Symphony Orchestra. Krips's first recording was made for Odeon Records in Vienna on 13 January 1937, conducting the Orchestra of the Wiener Staatsoper in two Rossini numbers from the Bernhard Paumgartner operetta Rossini in Neapel, sung by Richard Tauber. Krips conducted the Vienna premiere of the work ten days earlier. In 1950, Krips and the London Symphony Orchestra made a well-received recording of Mozart's Jupiter Symphony (London LPS 86). In 1955, Krips made a critically acclaimed recording of Mozart's Don Giovanni with the Vienna State Opera featuring Cesare Siepi, Fernando Corena, Walter Berry, Suzanne Danco, Lisa Della Casa and Hilde Gueden. In 1957, Krips conducted the Symphony of the Air in stereo recordings of the five Beethoven piano concertos with Arthur Rubinstein for RCA Victor. With the RCA Victor Symphony Orchestra Rubinstein and Krips also recorded Brahms Second Piano Concerto in 1958. During the years 1950-1958, Krips recorded various works by Mozart, Brahms, Dvořák, Schubert, Schumann, Tchaikovsky, Beethoven, Richard Strauss, Haydn, and Felix Mendelssohn. These performances included the Vienna Philharmonic, the London Symphony Orchestra, and the Israel Philharmonic. In January 1960, Krips recorded Beethoven's nine symphonies for Everest Records. For this set of recordings, Krips conducted the London Symphony Orchestra, and for the Symphony No. 9, the soloists included Donald Bell, baritone, Jennifer Vyvyan, soprano, Rudolf Petrak, tenor, and Shirley Carter (later known as Shirley Verrett), mezzo-soprano. The BBC Chorus, under the chorusmaster Leslie Woodgate also performed. This series of recordings was popular with music critics and the public, and the recordings have been reissued several times in authorized and in bootleg editions. Krips did not make any commercial recordings with the San Francisco Symphony, although many of his concerts were broadcast in stereo by San Francisco station KKHI. ^ a b c d e f g Ewen, David (1978). Musicians Since 1900. Wilson. p. 426. Retrieved 15 August 2017. ^ a b c d Sudrabs, Zaiga (2007). "Henry Joseph Krips (1912–1987)". Australian Dictionary of Biography. 17. Retrieved 15 August 2017. ^ "Josef Krips". Current Biography. H. W. Wilson Company. 1 June 1965. Retrieved 15 August 2017. ^ a b c Krips, Josef; Krips, Harrietta (2004). Josef Krips : pas de musique sans amour : souvenirs. Translated by Athanasiadès, Georges. Saint-Maurice: Editions Saint-Augustin. p. 12. Retrieved 15 August 2017. ^ a b c d "1969 Berkshire Festival" (PDF). Boston Symphony Orchestra. 1969. p. 34. Retrieved 21 August 2017. ^ a b "The Conductor". Brooklyn Academy of Music. February 1972. Retrieved 21 August 2017. ^ Terkel, Studs (2005). And They All Sang: Adventurs of an Eclectic Disk Jockey. New York: The New Press. p. 39. Retrieved 15 August 2017. ^ a b "Josef Krips". Hutchinson's Biography Database. Helicon Publishing. 2011. Retrieved 18 August 2017. ^ a b c d "Vienna Philharmonic". "100th birthday of Josef Krips". Vienna Philharmonic. Retrieved 2 August 2017. ^ a b c d e f McFadden, Robert D. (14 October 1974). "Josef Krips, the Conductor, Dies of Cancer in Geneva". New York Times. Retrieved 18 August 2017. ^ "Krips, Brüder". Oesterreichisches Musiklexikon online. Verlag der Österreichischen Akademie der Wissenschaften. n.d. Retrieved 23 August 2017. ^ Lebrecht, Norman (2001). The Maestro Myth: Great Conductors in Pursuit of Power. New York: Citadel Press. p. 99. Retrieved 15 August 2017. ^ Prodhan, Georgina (10 March 2013). "Vienna Philharmonic acknowledges honoring Nazi war criminal". Reuters.com. Reuters. Retrieved 15 August 2017. ^ Vigeland, Carl (16 August 1995). "The Human Side of Conductor Josef Krips". The Buffalo News. Retrieved 2 August 2017. ^ Brown, Emily Freeman (2015). "A Dictionary for the Modern Conductor". Lanham, MD: Rowman & Littlefield. p. 186. Retrieved 2 August 2017. ^ Peress, Maurice (2016). Maverick Maestro. Milton Park: Routledge. Retrieved 2 August 2017. ^ a b c Buffalo Philharmonic Orchestra. "Josef Krips BPO Music Director: 1954-1963". Buffalo Philharmonic Orchestra. Retrieved 2 August 2017. ^ McKelvey, John P. (May–June 1993). "Conductor Profile: Karl Böhm". American Record Guide. 56 (3): 50+. Retrieved 18 August 2017. ^ Stewart, Andrew (2004). "London Symphony Orchestra -- Recordings". London Symphony Orchestra. Retrieved 21 August 2017. ^ a b c d Trotter, Herman (May–June 1993). "The Buffalo Philharmonic". American Record Guide. 56 (3): 14+. Retrieved 18 August 2017. ^ Trotter, Herman (January–February 1999). "Buffalo's new conductor". American Record Guide. 62 (1): 16+. Retrieved 18 August 2017. ^ Goldman, Mary Kunz (17 March 2012). "Encore for Josef Krips; He was the BPO's longest-running music director next to JoAnn Falletta -- and the world is rediscovering his unique gifts". The Buffalo News. Retrieved 2 August 2017. ^ Werenfels, Judi (25 February 1960). "Brahms, Mozart". McGill Daily. 49 (81): 6. Retrieved 2 August 2017. ^ Hicks, Jack (6 November 1964). "Krips Conducts the N.Y. Philharmonic". The Wagnerian. Staten Island, NY: Wagner College. 34 (4): 4. ^ Hennion, Reeve (16 January 1965). "San Francisco's Orchestra Seeking 1.2 Million Raise". Chicago Tribune. Retrieved 2 August 2017. ^ a b San Francisco Symphony. "From the Archives: Podcasts". San Francisco Symphony. Retrieved 2 August 2017. ^ "Life Guide". Life. 1 November 1963. Retrieved 2 August 2017. ^ "Ramsey Lewis Set For Appearance With Toronto Symphony Orchestra". Indianapolis Recorder. 23 March 1968. Retrieved 4 August 2017. ^ Rustin, Terry (28 May 1970). "Josef Krips Departing: Honored Maestro In Final Concert". The Stanford Daily. 157 (67). Retrieved 15 August 2017. ^ Mechem, Kirke (2015). Believe Your Ears: Life of a Lyric Composer. Lanham, MD: Rowman & Littlefield. p. 69. Retrieved 15 August 2017. ^ De Jong, Diederik C.D (July–August 1993). "Mechem: The Jayhawk; Magic Bird Overture: Symphonies Nos. 1 and 2". American Record Guide. 56 (4): 123+. Retrieved 18 August 2017. ^ Craggs, Stewart R. (2015). William Walton: A Catalogue. Oxford: Oxford University Press. p. 153. Retrieved 15 August 2017. ^ "Josef Krips: Obituary". The Musical Times. 115 (1582): 1071. 1974. ^ a b c Reuters (14 October 1974). "Famed Conductor Josef Krips Dies". Chicago Tribune. Retrieved 2 August 2017. ^ "Gestorben Josef Krips". Der Spiegel. 21 October 1974. Retrieved 2 August 2017. ^ "Conductor Josef Krips attends a Tanglewood concert with Baroness Harriet Prochazka, ca. 1969". Boston Symphony Orchestra Archives. Boston Symphony Orchestra Archives. 1969. Retrieved 18 August 2017. ^ "Trauerfall Krips Harrietta". Todesanzeigenportal. 2015. Retrieved 18 August 2017. ^ "Brothers Join In Same Series" (PDF). Semper Floreat. 5 March 1963. p. 7. Retrieved 21 August 2017. ^ O'Hara, Daniel (16 May 2017). "Richard Tauber: A New Chronology" (PDF). Saltburn-by-theSea: O'Hara. p. 39. Retrieved 22 August 2017. ^ Gascoyne, George (December 1950). "New Records". Etude. 68 (12): 50. Retrieved 22 August 2017. ^ Tommasini, Anthony (2004). The New York Times Essential Library: Opera: A Critic's Guide to the 100 Most Important Works and the Best Recordings. New York: Henry Holt and Company. p. 128. Retrieved 22 August 2017. ^ Gruber, Paul (1993). The Metropolitan Opera guide to recorded opera. New York: W.W. Norton. pp. 302–303. Retrieved 22 August 2017. ^ Andry, Peter; Stringer, Robin; Locantro, Tony (2008). Inside the Recording Studio: Working with Callas, Rostropovich, Domingo, and the Classical Elite. Lanham, MD: Scarecrow Press. p. 172. Retrieved 22 August 2017. ^ Bourgin, Simon (January 1956). "The Tapes are Twirling". High Fidelity Magazine. 6 (1): 64. Retrieved 22 August 2017. ^ Sachs, Harvey (1996). Rubinstein: A Life. New York: Grove Press. pp. 444–445. Retrieved 22 August 2017. ^ Sachs, Harvey (1996). Rubinstein: A Life. New York: Grove Press. p. 447. Retrieved 22 August 2017. ^ Ericson, Ray (November 1959). "Brahms: Concerto for Piano and Orchestra, No. 2, in B flat, Op. 83". High Fidelity Magazine. 9 (11): 86. Retrieved 22 August 2017. ^ Fenech, Gerald (2003). "Josef Krips: Historic Decca Recordings, 1950-1958". Classical.net. Retrieved 15 August 2017. ^ a b Stuart, Philip (January 2017). "The World's Most Recorded Orchestra: The LSO Discography" (PDF). London: London Symphony Orchestra. pp. 379–380. Retrieved 15 August 2017. ^ Everest Records (1961). "Catalog of Classic Long-Playing Albums". Hollywood, CA: Everest Records. Retrieved 2 August 2017. ^ Bookspan, Martin (June 1961). "The Basic Repertoire: Beethoven's Ninth Symphony". HiFi/Stereo Review. Chicago, IL: Ziff-Davis Publishing Co. 6 (6): 24–28. Retrieved 15 August 2017. ^ Mechem, Kirke (2015). Believe Your Ears: Life of a Lyric Composer. Lanham, MD: Rowman & Littlefield. p. 57. Retrieved 15 August 2017. ^ Wigman, Brian (2014). "Ludwig van Beethoven: Symphony #2 in D Major; Symphony #4 in B Flat Major; London Symphony Orchestra/Josef Krips;Everest SDBR-3113". Classical.Net. Retrieved 2 August 2017. ^ Davis, Dan (2 July 2007). "Krips Conducts Mozart: The Great Symphonies Nos. 21-41". Classics Today. Retrieved 22 August 2017. This page was last edited on 22 March 2019, at 19:07 (UTC).